markets in the U.S. After that, try some salmon and chips, a classic Seattle dish, at one of the many fish restaurants on the Seattle waterfront. Those unafraid of heights will want to take the elevator up to the top of the Space Needle, which has become a symbol of Seattle with its unique flying-saucer-shaped observation deck located 520 feet above ground. From there you'll see unrivaled views of the city and the looming Mt. Rainier in the distance. On sunny days, the ferry is a nice way to see the city, relax, and explore one of the islands in the Puget Sound, like Whidbey. Outdoor activities are always abundant around Seattle with great hiking, water sports, and biking close by. Hotels can be found in great numbers downtown, but look to the University District for good deals. 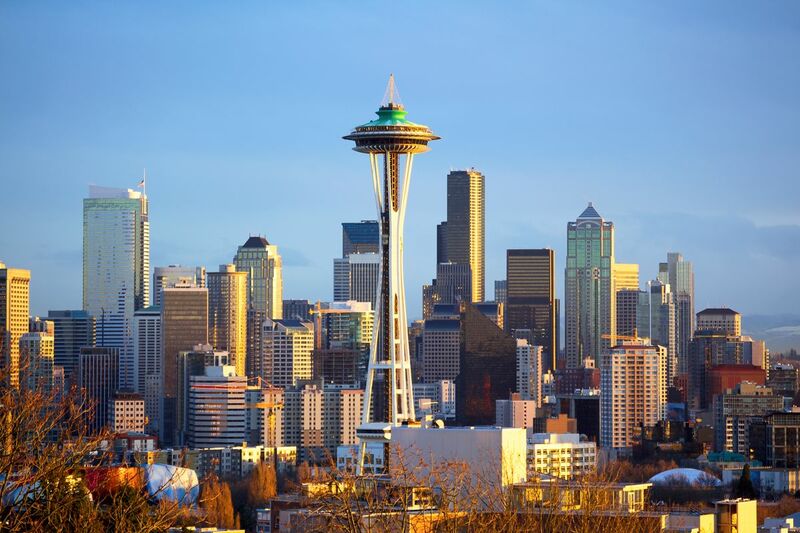 With a definite northwestern, independent feel, Seattle is a perfect combination of nature meets city making for the perfect getaway. of precipitation. For your best chances of not having your picnic rained out, visit between March and September when the rain is least heavily concentrated and the city’s residents make their way outdoors for music festivals galore. Temperatures in this coastal city are pretty mild, rarely getting hotter than the low 80s (27-29C) in the summer or dipping below freezing in the winter.